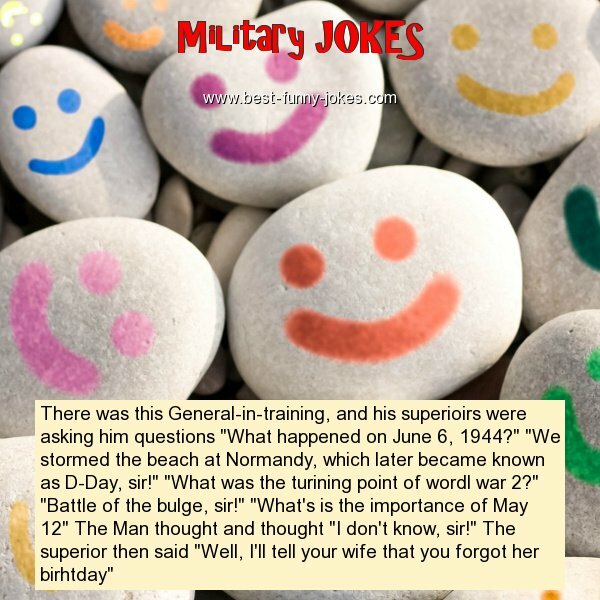 There was this General-in-training, and his superioirs were asking him questions "What happened on June 6, 1944?" "We stormed the beach at Normandy, which later became known as D-Day, sir!" "What was the turining point of wordl war 2?" "Battle of the bulge, sir!" "What's is the importance of May 12" The Man thought and thought "I don't know, sir!" The superior then said "Well, I'll tell your wife that you forgot her birhtday"